If the video does not start, click here (browser compatibility). In Cuba, Elsa Morejón Hernández, daughter of an ex-political prisoner and wife of prisoner of conscience Dr. Oscar Elías Biscet, has been publicly attacked various times by the government controlled mass media in the Island who call her " wife of a counter-revolutionary chieftain…" Because she is the wife of Dr. Biscet, Morejón is concerned for her physical well-being due to the arbitrary conduct of Cuban authorities. In 1998 Elsa Morejón was expelled from her job as a nurse due to her husband's pro-human rights activities and was evicted from her home along with Dr. Biscet and an adolescent son, depending, up to this day, upon the charity of friends to survive. Also, Cuban authorities have demanded she pay unjustified fines for penalties she has never committed. 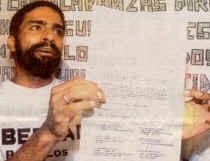 On February 22, 2000, Elsa Morejón was detained and taken to the 10th Police Precinct in Havana where she had to endure a 5 hour interrogatory. She was forced to undress and hand in a message written by Dr. Biscet in his "tapiada" prison cell where he was being held in Havana. On that day, Mrs. Morejón, in the company of an independent Cuban journalist", was on her way to inform diplomats at the French embassy of the grave situation her husband was facing. Right click to download, select "save target as"